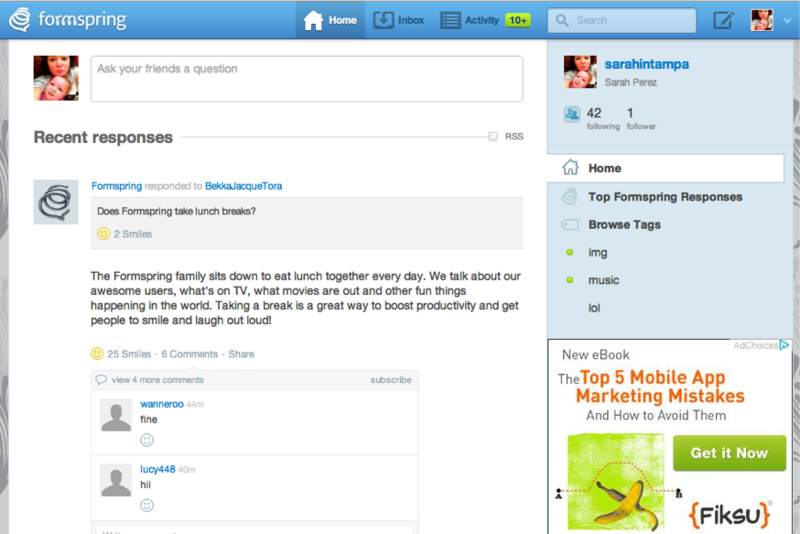 Q&A site Formspring is today announcing what the company says is its biggest news since its original launch back in 2009. Yes, Formspring has been overhauled. The company is shifting its focus from social Q&A, to a site that’s more focused on conversations built around interests. To complement this change, Formspring is also rolling out a completely redesigned website to highlight the company’s new direction. A mobile web version will soon follow. Users were creating accounts that were geared only towards asking questions around a particular interest, he says, and were participating in communities that weren’t necessarily tied to their social graph. Over 50% of the user base was participating in interest-based Q&A, he says, but exact numbers were hard to pinpoint because there was so much overlap between social questions and interest-based questions. In other words, users weren’t 100% on one side of the fence or the other. However, enough users were building up their interest graph through Formspring that it made sense to adapt the online experience to follow suit. On the revamped website, you’ll notice that there’s a now a new top navigation bar with a prominent search box for finding topics you care about. And while you can still connect with your social graph when posting a question (there are buttons for sharing to Facebook, Twitter and Tumblr, e.g. ), the bigger focus is on getting your question seen by the right community. For now, this is done via tagging. Tags are user-generated, can be both broad (music) or small (Adele), and can be applied to both questions and responses. In time, Olonoh says the site will offer more structure around the tags with high-level categorization features, but for now, tags are it. On the right-side navigation, users can browse the top questions of the day, click into the top tags, check their inbox, and access their profile. A Twitter-like following/follower friend structure is in place, allowing people to follow those who post about things they’re interested in. Oh, so it’s like Twitter now, but with more room to respond? Hmm. Formspring currently has 29.5 million registered users, and sees 19-20 million active uniques per month. Active users repsond to 9 questions per day on average, the company says. The updated website is live now, and the mobile site will arrive in a couple of weeks.